Some are sad that a company with all this British heritage has been ‘lost’ to the Americans. And it’s sad that all that philanthropic heritage was brought out of the archive and dusted off to leverage the deal, and keep those share values going up and up (a brand message strangely at odds with drumming gorillas and dancing eyebrows). Sad for the employees now fearing for their jobs. And the investors are sad the selling price didn’t go higher.. Sad to see a few people getting very very wealthy – having talked movingly about the need to ensure a better deal for very poor cocoa farmers. At the end of the day, sad that despite the heralded move of Cadbury’s Dairy Milk to Fairtrade – nothing has really changed. It’s global business as usual – just as inequitable as it’s always been – with money-making and decision-making in the hands of the very very few. Despite the inclement weather, people from all across London met last night in City Hall to share their plans for Fairtrade Fortnight 2010, themed The Big Swap. Lots of lovely resources, posters , leaflets and cute stickers are available from the Fairtrade Foundation . The focus this year is on trying to get the big tea companies to swap to Fairtrade . Traidcraft has got together with the Women’s Institute to create a natty campaign pack called ‘The Big Brew’ . 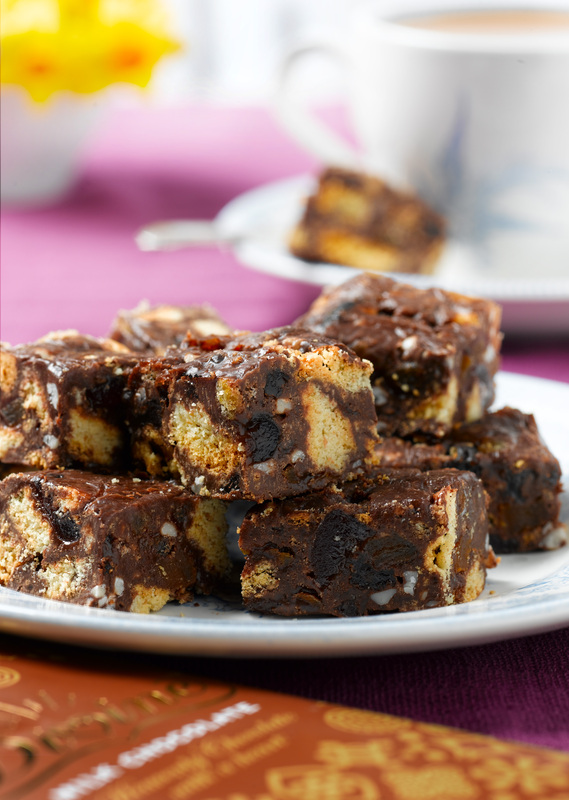 Everything stops for Fairtrade tea - and Sam Stern's Divine chocolate fridge cake! Cafédirect and Divine both have sampling packs you can request if you want to run your own event, and delicious recipes you can download, for the perfect Fairtrade tea party. A wonderful range of events are being organised, from Mad Hatter’s Tea parties to Strictly Fairtrade Dances, events in shops, libraries, cafes and churches , and an impressive range of events for children, schools and teachers, something for everyone. We also had a session on our fabulous new website so that everyone can now confidently blog about what is going on in their area. You are currently browsing the Divine Delights blog archives for January, 2010.